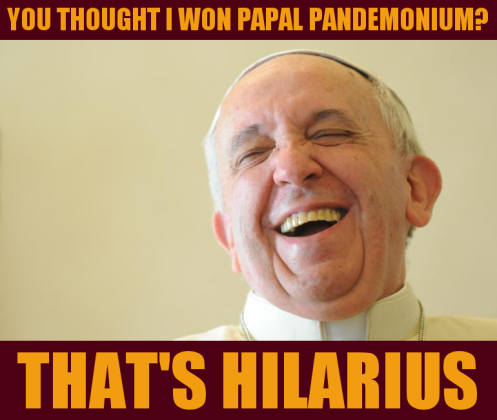 Papal Pandemonium: the final results! Thanks to everyone who voted throughout Papal Pandemonium! It was fun to research some of the fascinating (and, often, absurd) history of the papacy, and I’m glad I was able to share that with you. In the end, it wasn’t even close. Your winner is… HILARIUS. 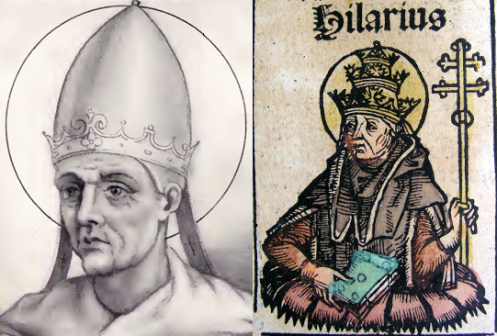 Would “Pope Hilary” have been selected as the best name? Who knows. Amusing that I am posting this just an hour after Hillary Clinton announced her candidacy for the presidency. Special thanks, once again, to my Papal Pedant, Eugene Finerman. Want to review something about a particular name? Click through the table below, which shows the round-by-round results. Maybe over the next 2,000 years we’ll see some more fun names.